SPECIAL NOTE: This chapter is the beginning of Volume Two in the official published version of Darkeye. While Volume One had few major changes between versions, Volume Two does contain some mildly significant story changes between the webnovel and published versions. The edited Volume Two will be available for purchase starting November 1st, 2014. The car drove on and on, the night city flashing by them, first a lighted portion, then a dark one. The sky was beginning to turn blue-gray; soon the sun would rise. Occasionally the car’s headlights would light up the startled eyes of a dog standing in the road before it ran for its life. Mhumhi swayed on his feet in the backseat, trying to keep his balance as the car turned this way and that. Beside him the hyena had actually curled up and gone to sleep. Mhumhi only wished he shared its tranquility; instead he felt sick and frightened. With enough in his stomach he might have vomited. Up front Maha had managed to turn and face him, keeping the fingers of one hand curled through the chain-link barrier. He could see his own fear mirrored in her eyes. He moved close to her, trying to stay steady on his feet, and licked her fingers. “It’ll be all right,” he said, trying to keep his voice quiet, but the hulker holding Tareq still turned and glanced back at him. Maha only looked at him, her eyes wet and puffy. “I won’t let them hurt you,” he said- a feeble thing to say, trapped in the backseat as he was. She gave a little sob. “They can’t,” Mhumhi said, though it was not as if the awful thought had not occurred to him. He tried not to remember Lamya’s smile, or Lisica’s dead body in her refrigerator. “Are they hyena-hulkers?” Maha asked, glancing at the sleeping hyena. Mhumhi had no guesses to offer her; it had bewildered him as well. He looked out the back window, vainly hoping to see some sign of Kutta again, but all he saw were empty city streets. The buildings rose tall here, and were sleek and shining with solar panels- they must have been close to the very heart of the city. He wondered why no police had come up to investigate the car yet- this must have been the very heart of their territory. Perhaps the car was simply moving too fast. He’d never even known cars could move in the first place. “I don’t think they speak dog,” Maha said, and sniffled. Mhumhi had suspected it already, but his heart still sank. It would make things much more difficult if he couldn’t try to reason with their captors. At that moment there was a loud rushing sound, and Mhumhi tensed and nearly fell of the seat again. There was concrete all around them, and yellowish light filled the car; they had entered a tunnel. The hyena put his head up sleepily. “Mhumhi, where are we going?” asked Maha, gripping the fence. The car suddenly slowed and came to a stop. Mhumhi scrabbled around and tried to peer through the chain-link- there was a sort of gate ahead of them, with thick metal bars, and it was rising upwards to allow the car through. Mhumhi gazed at the gate, as the car started to move once more: just as he feared, it rolled down behind them. The car went on a little ways, rushing through the featureless tunnel, until even Mhumhi felt himself getting a little heavy-eyed. Maha’s forehead had knocked against the chain-link, and she looked at him with half-lidded eyes as the car jostled them from side to side. Suddenly the light changed around them from dull yellow to blinding light. Maha jerked her head up, while Mhumhi flinched, blinking. They had entered what seemed to be a massive concrete dome, with innumerable cars just like the one they were riding in parked in rows. The car slowed to a stop. The two adult hulkers exchanged a few sharp words, then the one holding Tareq got out. The other grabbed Maha around the waist and tugged her out. Mhumhi saw her grab the door handle, struggling, but the hulker prised her off and slammed the door shut. Mhumhi found himself alone in the car with the hyena. It had woken up and was looking around, blinking. He jumped forward and bit it on the flank, making it squeal and scramble down below the seat, knocking around the forgotten pole. Mhumhi stood up against the window in its absence. He could see a great many more hulkers had come; some were holding Maha, who was still struggling, one had taken Tareq from the hulker with the injured arm. He could hear their voices, muted and unintelligible, over Maha’s cries. One pointed to him and suddenly they all were crowding close around the window, peering in, some shading their eyes. He put his ears back and wrinkled his lips up. Maha was saying something indistinct, but the other hulkers seemed to be talking loudly over her. Mhumhi himself was petrified, not sure if he should try to escape the car or hunker down within it at this point. The hulkers eventually seemed to reach some consensus, for the crowd parted and one came forward and opened the door a crack. Mhumhi stepped back warily. One of them was sliding in another pole with a loop on the end, reaching it towards his neck. If they thought he was stupid enough to fall for the same thing twice, they had another thing coming. Mhumhi ducked around the loop and grabbed the pole itself, feeling the thin metal dent beneath his teeth. He thrust forward, and felt the hulker give way with a cry. The car door swung open, and Mhumhi leapt out. The hulkers fell back away from him with yelps and shouts. Mhumhi zigzagged through them, inhaling deeply- there, there were Maha and Tareq, being herded away by three hulkers near the white concrete wall. “Mhumhi!” shrieked Maha, and she broke away from her captors and stumbled towards him. Mhumhi ran into her arms, even as the hulkers around them shrieked. She held him tight around the neck, pressing her face into his fur, while Mhumhi looked around at all the hulkers closing in and growled. “Dog!” came a high cry, and much to Mhumhi’s surprise Tareq toddled through the crowd of legs and grabbed the edge of one of Mhumhi’s ears with his small fingers. Mhumhi winced- both of them were sort of hurting him- but left his teeth exposed and his tail raised high. The assembled hulkers were looking at one another and murmuring. There was a guttural whine, and the crowd parted enough for Mhumhi to see the hyena jumping out of the car. A hulker was leading it by the neck with another one of those loop-poles, and it was coming along quite compliantly. “Let’s get away,” Mhumhi said, or started to say, when there was suddenly a sharp stabbing prick at his left shoulder. He jerked, making Maha’s grip on him tighten, and turned back with some difficulty to see a hulker withdrawing, holding something long in metal in his hands. It felt like something was stick in his shoulder, like a splinter, but he had no time to worry about it. Inexplicably his legs started to feel weak, and he wobbled slightly under her weight. He tried to open his mouth to reassure her that he was fine, but strangely enough his jaw muscles seemed constricted and immobile, and without her supporting him he swayed and slumped to the ground. “Mhumhi!” she cried, reaching for him again, but a hulker surged forward and grabbed her. Another grabbed Tareq, who set up a loud wail, echoing in the large chamber. Mhumhi tried to force himself up but only succeeded in his front legs- his back ones dragged, and then all the strength went out of him and he fell on his side. “Mhumhi! Mhumhi!” Maha was screaming, her face filled with terror. He stared at her hazily, as a ringing noise filled his ears, muffling it all out. The last thing he heard was her screaming at them not to eat him; then everything seemed to go gray and frozen. He stared at the grayness for some time before realizing it was a wall, a concrete wall. He gazed at it for what seemed a very long time, becoming aware of the pounding pain in his head, the sting from the innumerable small bite marks on his legs, and the ache of the old wound on his back leg, reawakened. With some effort he managed to raise his head. He was no longer in the domed space with the cars; instead he seemed to be in a tiny room, with three concrete walls and a barred gate. There was a lumpy sort of cushion and a basin of water. Everything smelled very strongly of hyena. That was the realization that made him finally force himself to his feet, wobbling a little as he did. It reeked of hyena, everything in this room, and beyond… He stepped forward and looked through the bars. He was greeted with innumerable giggles as he did, and he beheld a most terrible sight: a row of cells across from him, and a hyena pacing inside every one, laughing in their nervous way under his gaze. From the sounds on either side of him he could guess he was in the same sort of row, and the room seemed to stretch on for ever and ever, innumerable pacing, whining, laughing hyenas, and himself, gray concrete and harsh florescent lighting and the smell of fear. Mhumhi backed up, back and back, and bumped into the back wall. The hyena directly across from his was not pacing; it was huddled in the back corner of its own cell, hunched with its mouth open. It rolled its eyes towards Mhumhi and he saw the whites. Mhumhi himself began to tremble, and he shut his eyes, trying to cut off its gaze. He sank down onto the tattered cushion and put his head into it, longing again to shut his ears, his sense of smell, his own knowledge that he was in this place. The hyena across from him moaned. He couldn’t help but look at it again, and saw that it had pressed its head into the corner. It yawned, showing all of its fearsome teeth, and shuddered. Mhumhi sat on the pillow and watched it for a little while, but it did not do much else, just rocked and bumped its head against the wall and yawned. The whining and chattering all around was ceaseless, and every now and again he would hear a metallic banging, as if someone had upended their water dish. The hyena across from him drooled. Mhumhi rose to his feet and shook himself. The place had a madness in it that was creeping in at him from all sides, threatening to wash over him. He had to try to escape, as futile as it might be. He approached the door again, his instincts jangling. The hyenas in the opposite row seemed to get excited, rushing to their own doors, all except his neighbor from across the way, who stayed huddled in his corner. Mhumhi did his best to calm his heart and ignore them; if his door was secure, at least it meant that theirs must be too. He reared up to sniff the door lock, his paws slipping slightly on the tarnished bars. It was a sort of handle set on the outside, not really a real lock. His also had string around it, which was odd, because he didn’t see any on any of the hyenas’ doors. It was tying his handle down to the bars, preventing it from being lifted up. He stuck his nose through the bars and managed to nip at a bit of it. All it took was a bit of tugging and wriggling his head from side to side before the fibers separated. He tugged the string off of the handle and spat it out; then went to the real work- pushing up the handle through the bars. It was heavier than the car door handle, and even harder to get at, especially when his weight on the door pushed it flush. The hyenas giggled anxiously as they watched him, and feeling like he had an audience, he could not very well give up. He balanced precariously on his hind legs and thrust one forepaw through the pars, trying to aim it like a hulker would, and with a great deal of straining managed to lift it up underneath the handle. His door clicked open. The hyenas around him hopped and yowled, pacing and bobbing their heads up and down. He took it as congratulations, or at least some sort of excitement. It was hard to walk out into that corridor all the same, but he made himself do it, stumbling over the narrow metal grate that covered the drain in the middle. The hyenas all seemed to go mad as he passed them, some of them slamming themselves against the gates, some thrashing mindlessly in place, jerking back and forth, seeming almost helpless to stop themselves. The noise level rose to a cacophony. Mhumhi found himself running, running through all of them down the long hall to the distant white door. gleaming at one end. It had a handle like the door at his old home, one you could depress, and Mhumhi felt a sort of flutter in his chest as he jumped up to put his paws on it and opened the door. It lead him out into another hallway, the shrieks and moans of the hyenas following for an instant, then vanishing entirely as the heavy door swung shut behind him. It left him with a great sense of relief, but there was also a new problem: this new hallway held a cluster of hulkers, and they were all staring at him. This of course did nothing- they merely stared at him, eyes wide, and huddled closer together. Mhumhi wheeled around, deciding it would be best to avoid any more mysterious, sleep-inducing pinpricks if he could, and ran the other way. When he turned the corner he stopped to sniff, hoping to catch something of Maha and Tareq, but all he could sense was the pervasive smell of hyena and underneath that, unfamiliar hulker. More hulkers were trotting down this hall towards him, voices loud. He wheeled around again and trotted in a new direction, going as an easy lope- they couldn’t catch up to him. He kept his nose in the air, hoping, but no trace of either puppy emerged at him. He passed a junction, and more hulkers emerged. These ones were carrying poles. He put his ears back and increased his speed, flying past them, and other ones that were standing in the hallway- they shrieked and pressed themselves against the walls. He felt his old hunger flare up at this, but suppressed it easily. It was certainly not the time. He whipped around a corner and smelled something familiar, though it wasn’t Maha. He pushed against a door, taking a gamble, and slipped through it before his pursuers ever turned the corner. It was a bathroom, just like the ones he had once seen in the wolves’ den: many stalls and toilets, with a counter supporting a bank of sinks. He took a moment to pant and recover his breath, than leapt up onto the sinks and turned one on for a drink of water. At least this time his own reflection did not frighten him. He looked at himself as he lapped at the thin stream of cool water. The last time he had seen his entire reflection, he had been somewhat fatter, and less scarred. The scar on his leg from the snare was still pink and raw, and there was still dried blood in his muzzle from his encounter from the foxes. If his past self had seen this in the mirror, it certainly would have given him a greater fright. At least this time there would be no wolves in the stalls, he thought. In the reflection behind him a stall door moved, and Mhumhi froze. There came a loud flush, and out stepped a hulker, a young-looking male, tugging up his lower coverings with both hands. He looked at the mirror and stared directly at Mhumhi’s reflection, confusion clouding his features. Mhumhi stared back through the glass for a moment, really not knowing what to do. The water was still trickling loudly from the sink, and he reached out his paw to push it off. This action seemed to make the young hulker’s eyes bulge out of his head. He fell back against the wall behind him. Mhumhi turned and jumped lightly off the counter, sensing little danger from this one. It seemed too young and frightened. He decided to try to be gentle with it. The hulker merely stared at him, chest fluttering, and put a hand over his mouth. Mhumhi stepped a little closer, and it squeaked. The hulker made another muffled squealing noise, and put his other hand over his mouth as well. This was pointless; Mhumhi decided, the thing clearly didn’t understand him, and the longer he stayed, the more terrified he was going to get. A very nasty part of his brain suggested having a bite or two while it was there, as his stomach was empty and his head was still pounding, but he firmly quashed the notion. He went to the door and jumped against it, but here he encountered another problem- the door seemed to only swing the opposite way, and the handle was a vertical rung of metal, hard for Mhumhi’s teeth to grip. He took a couple tries at it, twisting his head, then in frustration looked back at the hulker, which hadn’t moved. The hulker gazed at him from behind his hands. Mhumhi alternated his glance between him and the door, trying to be more pointed with each look. The hulker gazed at him stupidly, then it put one hand down and tried to push itself up. “Yes, yes, did you get it?” Mhumhi asked, giving a little bounce and wagging his tail, and the hulker slipped and fell with a whimper. “Sorry,” said Mhumhi, backing away hastily. The hulker gave him a wide-eyed look and slowly got to his feet, moving jerkily towards the door. He pulled it wide open. 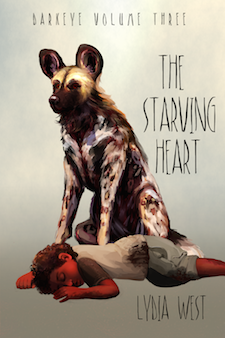 “Thank you,” said Mhumhi, looking up at him and wagging his tail fervently, hoping he would get the message. He trotted through the open door and back down the now-empty hallway, sparing a glance back: the hulker had slid down the outside of the door back on his rump, and was staring at the ceiling. That had certainly been an interesting encounter, Mhumhi was just thinking to himself, as he turned the corner. Then he gave a sharp yelp- something heavy had flown into him and was weighing him down. It was braided rope, a net, all snarled around him as he twisted underneath it, whining. There were hulkers coming at him from both sides at a run, some had poles and some had metal things in their hands. Mhumhi felt a fresh surge of panic and thrashed even more, but he could gain no purchase against the heavy fibers, and his paws had already become snarled in the thing. He slipped and fell on his side. Pounding footsteps approached, and then he saw his hulker friend from the bathroom staring down at him, wide-eyed and out of breath, then a female hulker voice started speaking loudly, giving commands. Hulker hands grabbed his body, weight pushing him down and holding him immobile underneath the net, even as he struggled. Someone pulled part of the net back, freeing his head, and he waved his open jaws back and forth, a feeble warning. A loop was slipped around his neck, then another, and then- most horrifying- he saw a hulker approaching him with something plastic in her hands. It was a muzzle, like the one the hyena had been wearing. At this he struggled and growled and whined, nearly pleading, but they were holding him down too tightly- too tightly- the female hulker pushed it roughly over his snapping jaws and fastened it together over his head and behind his ears. She let go and he shook his head, vainly trying to dislodge it. It was clearly made for a larger animal, for it chafed and wiggled, but it stayed firmly over his nose, filling his nose with his own hot, panicked breath. The female hulker said something, and Mhumhi was lifted up, his neck still held by the two loops, and the net was pulled away. Suddenly his own feet were underneath him again. Mhumhi took a moment to understand his situation, shaking a bit, feeling the dual pressure around his neck and that awful heavy weight around his muzzle. He raised a paw to scratch at it and the pressure around his neck tightened. The female hulker said something, and the ones holding the poles pulled forward, forcing him to walk or be dragged between them. He twisted fruitlessly, then gave in. They marched him forcibly back down the hall. He panted heavily through the muzzle, his fur growing moist and hot from his own breath, and risked a glance backwards. The young male hulker was still trailing behind the group, as wide-eyed as ever. The lead hulker threw open a door, and Mhumhi whined and pulled back. The room beyond smelled strongly of hyena, and had cages everywhere, and shiny metal tables. He thrashed, fear filling him- he did not want to go in there. It reminded him too much of the building on silent street, where there had been an unlocked cage with quiet bones inside. But they dragged him inside anyway. “distant white door. gleaming at one end.” should that be a comma? “silent street” You are pretty inconsistent in capitalization of streets – sometimes you capitalize both words, sometimes you don’t capitalize street, and sometimes you capitalize neither.